The Love-Philtre of Ikey Schoenstein (1906) is one of O. Henry's lesser-known comedic stories about a pharmacist who concocts a 'philtre' or love-potion. The Blue Light Drug Store is downtown, between the Bowery and First Avenue, where the distance between the two streets is the shortest. The Blue Light does not consider that pharmacy is a thing of bric-a- brac, scent and ice-cream soda. If you ask it for pain-killer it will not give you a bonbon. The Blue Light scorns the labour-saving arts of modern pharmacy. It macerates its opium and percolates its own laudanum and paregoric. To this day pills are made behind its tall prcscription desk--pills rolled out on its own pill-tile, divided with a spatula, rolled with the finger and thumb, dusted with calcined magnesia and delivered in little round pasteboard pill-boxes. The store is on a corner about which coveys of ragged-plumed, hilarious children play and become candidates for the cough drops and soothing syrups that wait for them inside. Ikey Schoenstein was the night clerk of the Blue Light and the friend of his customers. Thus it is on the East Side, where the heart of pharmacy is not g1ace. There, as it should be, the druggist is a counsellor, a confessor, an adviser, an able and willing missionary and mentor whose learning is respected, whose occult wisdom is venerated and whose medicine is often poured, untasted, into the gutter. Therefore Ikey's corniform, be-spectacled nose and narrow, knowledge-bowed figure was well known in the vicinity of the Blue Light, and his advice and notice were much desired. Ikey roomed and breakfasted at Mrs. Riddle's two squares away. Mrs. Riddle had a daughter named Rosy. The circumlocution has been in vain--you must have guessed it--Ikey adored Rosy. She tinctured all his thoughts; she was the compound extract of all that was chemically pure and officinal--the dispensatory contained nothing equal to her. But Ikey was timid, and his hopes remained insoluble in the menstruum of his backwardness and fears. 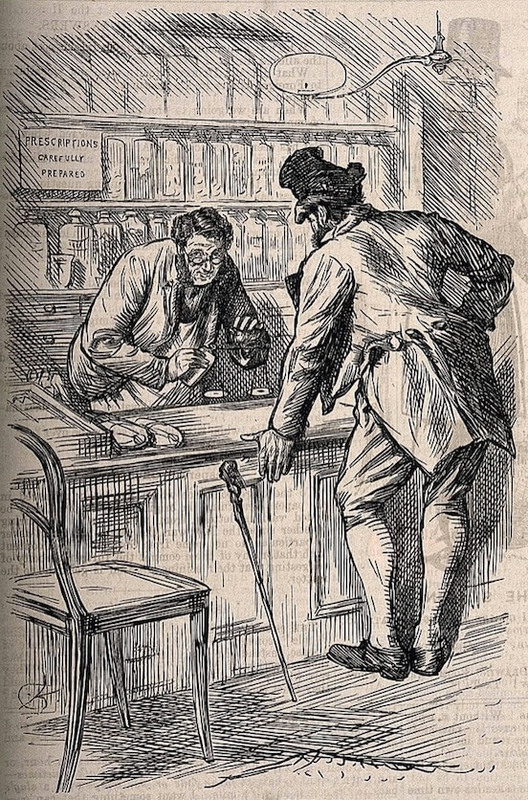 Behind his counter he was a superior being, calmly conscious of special knowledge and worth; outside he was a weak-kneed, purblind, motorman-cursed rambler, with ill-fitting clothes stained with chemicals and smelling of socotrine aloes and valerianate of ammonia. The fly in Ikey's ointment (thrice welcome, pat trope!) was Chunk McGowan. Mr. McGowan was also striving to catch the bright smiles tossed about by Rosy. But he was no outfielder as Ikey was; he picked them off the bat. At the same time he was Ikey's friend and customer, and often dropped in at the Blue Light Drug Store to have a bruise painted with iodine or get a cut rubber-plastered after a pleasant evening spent along the Bowery. One afternoon McGowan drifted in in his silent, easy way, and sat, comely, smooth-faced, hard, indomitable, good-natured, upon a stool. "Ikey," said he, when his friend had fetched his mortar and sat opposite, grinding gum benzoin to a powder, "get busy with your ear. It's drugs for me if you've got the line I need." Ikey scanned the countenance of Mr. McGowan for the usual evidences of conflict, but found none. "Take your coat off," he ordered. "I guess already that you have been stuck in the ribs with a knife. I have many times told you those Dagoes would do you up." Mr. McGowan smiled. "Not them," he said. "Not any Dagoes. But you've located the diagnosis all right enough--it's under my coat, near the ribs. Say! Ikey--Rosy and me are goin' to run away and get married to-night." Ikey's left forefinger was doubled over the edge of the mortar, holding it steady. He gave it a wild rap with the pestle, but felt it not. Meanwhile Mr. McGowan's smile faded to a look of perplexed gloom. "That is," he continued, "if she keeps in the notion until the time comes. We've been layin' pipes for the getaway for two weeks. One day she says she will; the same evenin' she says nixy. We've agreed on to-night, and Rosy's stuck to the affirmative this time for two whole days. But it's five hours yet till the time, and I'm afraid she'll stand me up when it comes to the scratch." "You said you wanted drugs," remarked Ikey. Mr. McGowan looked ill at ease and harassed--a condition opposed to his usual line of demeanour. He made a patent-medicine almanac into a roll and fitted it with unprofitable carefulness about his finger. "I wouldn't have this double handicap make a false start to-night for a million," he said. "I've got a little flat up in Harlem all ready, with chrysanthemums on the table and a kettle ready to boil. And I've engaged a pulpit pounder to be ready at his house for us at 9.30. It's got to come off. And if Rosy don't change her mind again!"--Mr. McGowan ceased, a prey to his doubts. "I don't see then yet," said Ikey, shortly, "what makes it that you talk of drugs, or what I can be doing about it." "Old man Riddle don't like me a little bit," went on the uneasy suitor, bent upon marshalling his arguments. "For a week he hasn't let Rosy step outside the door with me. If it wasn't for losin' a boarder they'd have bounced me long ago. I'm makin' $20 a week and she'll never regret flyin' the coop with Chunk McGowan." "You will excuse me, Chunk," said Ikey. "I must make a prescription that is to be called for soon." "Say," said McGowan, looking up suddenly, "say, Ikey, ain't there a drug of some kind--some kind of powders that'11 make a girl like you better if you give 'em to her?" "Tim Lacy told me he got some once from a croaker uptown and fed 'em to his girl in soda water. From the very first dose he was ace-high and everybody else looked like thirty cents to her. They was married in less than two weeks." Strong and simple was Chunk McGowan. A better reader of men than Ikey was could have seen that his tough frame was strung upon fine wires. Like a good general who was about to invade the enemy's territory he was seeking to guard every point against possible failure. "I thought," went on Chunk hopefully, "that if I had one of them powders to give Rosy when I see her at supper to-night it might brace her up and keep her from reneging on the proposition to skip. I guess she don't need a mule team to drag her away, but women are better at coaching than they are at running bases. If the stuff'll work just for a couple of hours it'll do the trick." "When is this foolishness of running away to be happening?" asked Ikey. "Nine o'clock," said Mr. McGowan. "Supper's at seven. At eight Rosy goes to bed with a headache. At nine old Parvenzano lets me through to his back yard, where there's a board off Riddle's fence, next door. I go under her window and help her down the fire-escape. We've got to make it early on the preacher's account. It's all dead easy if Rosy don't balk when the flag drops. Can you fix me one of them powders, Ikey?" Ikey Schoenstein rubbed his nose slowly. "Chunk," said he, "it is of drugs of that nature that pharmaceutists must have much carefulness. To you alone of my acquaintance would I intrust a powder like that. But for you I shall make it, and you shall see how it makes Rosy to think of you." Ikey went behind the prescription desk. There he crushed to a powder two soluble tablets, each containing a quarter of a grain of morphia. To them he added a little sugar of milk to increase the bulk, and folded the mixture neatly in a white paper. Taken by an adult this powder would insure several hours of heavy slumber without danger to the sleeper. This he handed to Chunk McGowan, telling him to administer it in a liquid if possible, and received the hearty thanks of the backyard Lochinvar. "Oh, that stuff you gave me!" said Chunk, broadening his grin; "well, it was this way. I sat down at the supper table last night at Riddle's, and I looked at Rosy, and I says to myself, 'Chunk, if you get the girl get her on the square--don't try any hocus-pocus with a thoroughbred like her.' And I keeps the paper you give me in my pocket. And then my lamps fall on another party present, who, I says to myself, is failin' in a proper affection toward his comin' son-in- law, so I watches my chance and dumps that powder in old man Riddle's coffee--see?" Add The Love-Philtre of Ikey Schoenstein to your own personal library.